So I’m finally back in the Great Lakes state after a week in Hawaii. I can’t complain. Hawaii was great. The weather is perfect (85), the humidity is (mostly) low, and there are few if any bugs to swat away. But I didn’t like Waikiki, where I stayed. The (man-made) beach and the shopping and entertainment district there is just too busy. Too many people. Too much traffic. Too much noise. Good thing I got “Lost” while I was there. One of a few excursions my wife and I took while on the island of Oahu was a Hummer tour of the “island of Lost,” where the TV show was filmed. 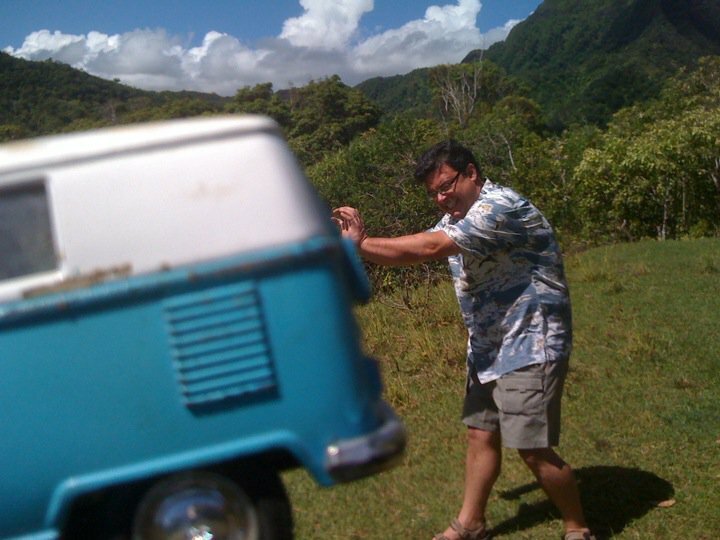 Most of the filming locations, including where the VW bus was rolled down the hill (see the iPhone forced perspective pic above), are located on Kualoa Ranch. Yes, I know Hummers are bad. But this one was used to its full 4×4 potential. Here’s a sample of what we saw. The tour driver played the creepy “Lost” theme music during our ride. This is the kind of “environment” I like. Natural. Quiet. Pure Hawaii, I guess. Wearable Dirt, on a Shirt, Helped Save a Company.